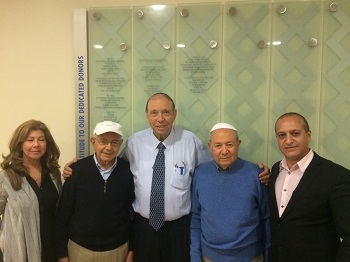 The Picciotto family from Brazil was honored for their contributions to the Hadassah Hospital in dedication ceremonies at the Sarah Wetsman Davidson Hospital Tower. 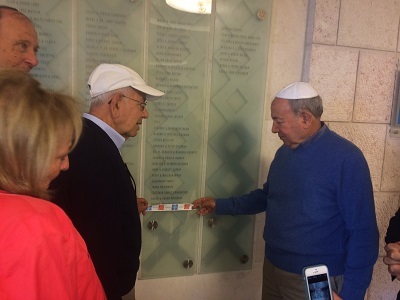 Brothers Adolfo and Jack Picciotto and their wives unveiled two plaques on the main floor of the Tower, and then proceeded to the Bone Marrow Department. Prof. Reuven Or, Director of the Department of Bone Marrow Transplantation and Cancer Immunotherapy welcomed them and expressed his deep appreciation for the contribution the Piccotto Family has made. He told them that their donation to Professor Or’s Research Center will increase the capacity of the center to do cutting-edge research in the field of Bone Marrow Transplantation. A Rabbi who was born in Brazil blessed them for saving lives through the research they have supported at Hadassah and a guitarist sang two prayers in their honor. The family was very moved by this meaningful ceremony, particularly as a family member had died recently, three months after a bone marrow transplant.